The Little House of Concrete Bookshelves: Ian Rankin "Strip Jack" and "The Black Book"
With three Rebus novels under his belt and, presumably, the majority of the short stories that comprise A Good Hanging under his belt, you'd have to guess that Rankin knew he had the makings of an on-going series when he started on 1992's Strip Jack. 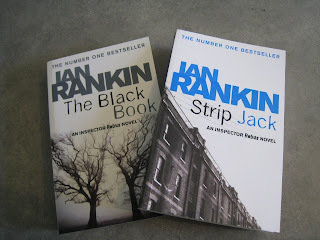 As the first of the stories collected as Rebus: The St Leonard Years Rankin admits in the foreword that the fourth Rebus novel is a conscious move out of a fictional Edinburgh into a real one. Up to this point, Rebus has been operating out of Greater London Road, but with that fictional location about to close he's moved over to the actual headquarters of the Lothian and Borders Police at St Leonards. However one wonders why, having read that comment and noted a map in the Reading Group Notes at the back of the book, it's impossible to locate most of the locations in the story on the aforementioned map. Apart from that very minor quibble, there are a couple of emerging themes that get a fairly thorough going over in Strip Jack, with the main one being Rebus' attempts to dig around under the surface to find out what's actually going on where the movers and shakers who actually run the show are concerned. Kicking off with a Saturday night raid on a discreet brothel operating in a fairly swish neighbourhood (one of the better streets of the New Town) largely occupied by Saab and Volvo driving lawyers, surgeons and university professors, the plot immediately thickens when one of the punters caught in the cot turns out to be popular hardworking MP Gregor Jack. Much of that thickening comes when those inside are escorted off the premises and have to run the gauntlet of the reporters and photographers who've seemingly been tipped off about the raid and the possibility of it landing a reasonably big fish. No prizes for guessing the front page story in the Sunday papers. Under normal circumstances the standard operating procedure in cases like this is to have the friends and family gather 'round the bloke under the floodlights, but in this case Jack's wife Elizabeth, a noted partygoer who's always been inclined to follow her own path, has gone missing and it soon becomes obvious that Jack's friends, most of whom share the same home town, have issues of their own. Lizzie's body is found in circumstances that seem to match another recent death, and there's an obvious suspect, a drunk who brags about the first killing, is released for lack of actual evidence, gives a false address and vanishes while Rebus is preoccupied trying to track down a valuable collection of stolen books..
Mrs Jack's body turns up on property owned by actor Rab Kinnoul, a key member of the Jack social circle, and while Rebus starts out sympathetic to the MP's problems, it soon becomes obvious that someone out there is out to destroy him by stripping him of his good name and political standing in a real life equivalent of the Strip Jack Naked card game, which provides the book's title. But while the aim seems fairly clear the key questions concern the who? and the why? Delving into matters Rebus discovers that Lizzie, the only child of mogul Sir Hugh Ferrie, has a well-disguised private life based around wild weekends at an isolated cottage and the investigation meanders through a labyrinth of red herrings, deceitful alibis, secret liaisons until a remark to Rebus' offsider Brian Holmes brings in the key element that slots everything into place. Along the way there are the regular Rebus issues with the demon drink, Rebus' own inner demons and the on-going difficulty of maintaining personal relationships when you're a semi-obsessive sleuth working long and irregular hours. Those issues run right through the series, but the interpersonal themes are a key component of the plot line of the fifth Rebus novel, 1993's The Black Book which introduces key character Siobhan Clarke and brings Big Ger, Morris Gerald Cafferty, who's been an incidental character up to this point in the series, to the forefront as Rebus' bete noir. On the personal front, there's the on-going attempt to maintain the relationship with new female interest Doctor Patience Aitken, complicated by the fact that he's effectively moved in with her and has leased his flat to a group of students. That becomes an issue when, first, Rebus' brother Michael reappears on the scene, seeking accommodation. He ends up in the box room at the flat, which means that Rebus, locked out of Patience's place after failing to arrive for dinner, ends up sleeping on his own sofa for a spell. That happens after an unexpected encounter with an old Army acquaintance, the dodgy Deek Torrance, who can get his hands on 'anything from a shag to a shooter'. These things play out against a background where Operation Moneybags is aimed at taking down one of 'Big Ger' Cafferty's money-lenders and Rebus's colleague Brian Holmes is in a coma after being attacked in the carpark of the Elvis-themed Heartbreak Cafe. Investigating the Holmes attack, Rebus interviews restaurant owner Eddie Ringan, Eddie's gay and business partner Pat Calder, and Brian's girlfriend, Nell Stapleton who mentions Holmes' notebook, suggesting that something in it prompted the attack. One particular entry in the eponymous Black Book sparks Rebus' interest, a cryptic shorthand reference to a poker game on the night of the fire that burned down the Central Hotel five years ago. An unidentified body was found in the ruins, and the autopsy reveals a shot through the heart rather than the fire as the cause of death, and that the victim had suffered a broken arm at some point in time. Piecing these things together takes time when you're supposed to be doing something else, but a glance at the list of those who were on the premises when the hotel burned down reveals someone Rebus knows well enough to chase down details in the form of the elderly Matthew Vanderhyde who may be blind but was at least on the premises. As it turns out Vanderhyde was there to have a quiet word with 'Black Aengus' Gibson, heir to the Gibson brewery and subsequently reformed wild man. At the time 'Black Aengus' was in full wild man mode, though his family's influence has managed to remove his name from the official record of the incident. Then, when Rebus discusses the matter with the newly-arrived Siobhan Clarke, who's been reading around the case, comes up with Tam and Eck Robertson, the 'Bru-head Brothers', who disappeared around the time of the fire and match part of the shorthand reference. Before they disappeared they were working for Big Ger, which suggests that Cafferty may have been there as well. Sniffing around Big Ger, however, has its dangers. With the possibility of the attack on Holmes being related to the case, after Michael Rebus is found hanging by his legs from the Forth Rail Bridge and an attack on Rebus himself, her decides he needs protection, and when Holmes regains consciousness he's quick to confirm Rebus' suspicions and inform him that the source of the information was restaurant owner Ringan, who was was moonlighting at the Central. From there things move rather swiftly, with the regulation twists and turns, apparent dead ends and although Rebus manages to put things together there's a nasty sting in the tail when the hand gun he buys for protection turns out to be the weapon used to kill the previously unidentified corpse from the fire. All in all, with matters seemingly sorted there's the problem of managing a conviction, and when you look at it, failure to do so, given the circumstances in this story will be enough to fuel Rebus' on-going pursuit of Big Ger well into the future.